Judges of Supreme Court and Madras High Court contributed over Rs. 1 Crore towards restoration and rehabilitation of those affected by the December flood, Tamil Nadu government said yesterday. Advocate general A L Somayaji presented a cheque for Rs. 128 Crore received as contribution from judges, to Chief Minister J Jayalalitha recently, an official release said. The judges of the Supreme Court, Madras High Court and Judicial Officers had contributed Rs.1.18 Crore while Administrator General and Official Trustee had given Rs. 10 lakh towards Chief Minister’s Public Relief Fund. 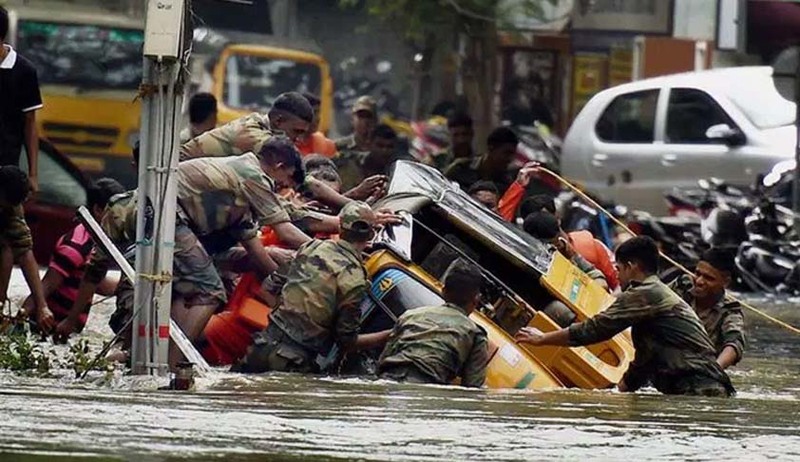 The government has so far received Rs.373.32 Crore towards the relief fund, it said. In December 2015 the Supreme Court Bar Association of India (SCBA) had formed “Chennai Relief Funds” to help the Chennai flood victims. Senior Advocate Mr. K.K. Venugopal who was special invitee in the Executive Committee meeting of the Association, had offered Rs. 25 lakhs at the meeting itself. Former President of SCBA Senior Advocate Dushyant Dave, had also contributed Rs.20 lakhs towards the fund. In the catastrophic flood that hit Coromandel Coast in November-December 2015 more than 500 people were killed and over 18 lakh people were displaced. With estimated damages and losses ranging from Rs. 50000-100000 Crore the flood was among the costliest natural disasters of the year.